If you’d like to the kids to have fun but also to learn then you definitely want to checkout Ivy Kids. It’s a new monthly fun-filled educational children’s subscription boxes created by teachers to encourage curiosity, problem solving, skill building, and creativity! 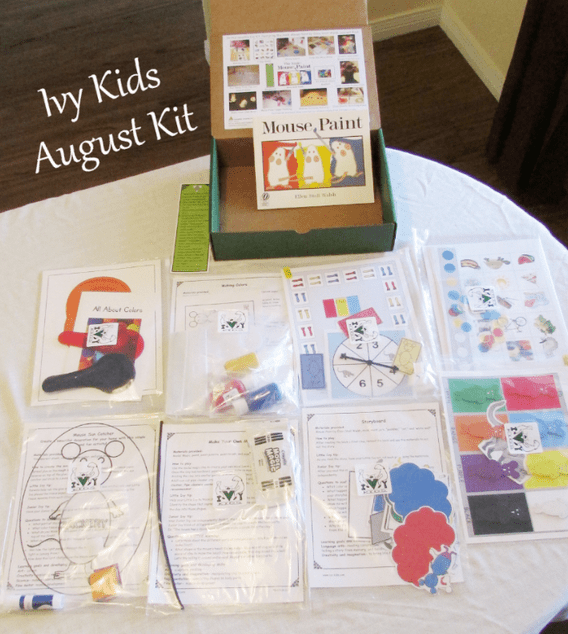 You can read BabyCostcutters’ full review of the July and August Ivy Kids Kits HERE. One lucky winner will receive July and August Ivy Kits!! Love the book and science booklet. The feed the frog game looks great for kids! I like the frog word games. I’m a former preschool teacher and now g’ma. I love these kits they’re awesome and filled with great activities that will keep kids busy this summer and learning too! I like the Create your own frog habitat. How fun for my son. I like the Feed the Frog Game the best! I like the finger frogs activity! All about Frogs is really cool!!! I think the Race to The Pond game would be loved by my grandkids. I like the create the frog habitat. I like the froggy actiivity toys. We love frogs! But I’m diggin the feed the frog game for the July kit! I really like the frog paper bag craft. All of it looks like fun, but my son would probably like the Feed the Frog game best! I think my son would most enjoy the frog habitat. Everything looks like fun though! I love the Jump, Frog, Jump! book! Create Your Own Frog Habitat! That would be fun for all of us. Mt daughter would love the frog habitat. I love all the crafts and the jump frog jump book! I love the frog theme! i like the The book Jump, Frog, Jump! The Create Your Own Frog Habitat looks like a lot of fun. I love how all the activities are centered around a theme that corresponds with the book! I think my kids would like the Frog Puppet that is used for storytelling. Thank you for the giveaway!! I think my granddaughter would love the Feed the Frog Game. She would have a blast using the tongs to feed the frog! The create your own habitat sounds amazing to complete with my children. My oldest would especially love doing this. I like the ABC and 123 game sets!